I am often asked by parents of older children, how come their child has not returned to them when they are clearly old enough to look back and understand what has happened. Answering this questions is not difficult when one considers the way in which the alienating parent colonises the mind of the child, dividing it repeatedly into good and bad, black and white, right and wrong through repeated whispers of distortion, until the internalised landscape looks like a wall has been built into it. The issue is that the child, repeatedly exposed to the Chinese whispers of the parent, does not know that the wall is there and believes that their mind is wholly their own and independent of any of the whispering which has been going on in their lives, sometimes for many years. Add to that the upholding of the whispers of distortion through the trips and traps which are cleverly laid by the alienating parent and what you have is a dynamic which is almost impossible to detect. And so the child grows, unsuspecting that the wall in their mind through which no positive information about the rejected parent can pass, is even there. Working with people whose minds are scaffolded by Chinese walls requires the practitioner to tread extraordinarily carefully. This is not a landscape through which one stampedes crusader like ripping down walls and calling out whispers. If one tries, the wall solidifies and the whispers intensify. This world is one in which quiet footsteps lead to dawning realisations and in which walls which are not even known about, are removed by the individual encounter with perspective. Those who cling to wholly right and wholly wrong narratives are those with walls inside their minds which hold them fast and steady in their self belief. Such people are often rigid in their thinking, highly defended and protecting themselves against shame and guilt. Behind the wall in the alienated child’s mind is a reservoir of shame and guilt, which laps against the defences and at times threatens to break through. Many alienated children grow up to become rejected parents and it is within that group of rejected parents who cling to the right/wrong dynamic the tightest, that the Chinese whispers and Chinese walls are most regularly seen. Helping rejected parents requires a deftness of hand and a kindness of heart. It requires an examination of the thinking patterns of the parent and their capacity to hold ambivalent thoughts. As we do this work we are seeking to understand whether this parent is a now adult alienated child who has been prepared for their fate by the laying down of the wall in their mind in their youth. There is a high proportion of alienated adult children in the overall group of parents who are rejected and when we look closer at the Chinese whisper and Chinese wall analogy it is not difficult to see why. I have written many times about the way in which alienated children become alienated parents but not much about the Chinese whispers and Chinese wall analogy which is something that we see repeatedly in the recovering alienated child. Helping to take that wall in the child’s mind down is one of the ways that we build into our work a trans-generational intervention which prevents the child from becoming one of the the next generation of rejected parents. Breaking down the wall in the child’s mind is about the practitioner being aware of the wall and how to approach it in the child’s mind even though the child does not know it is there. The wall is made up of those things which the child has been told, not necessarily in words, which have created the division in the mind into all good and all bad. Understanding what the wall is made up of is the first task for any practitioner working with the alienation dynamic. And understanding that those things which make up the wall in the alienated child’s mind, may be mirrored in the rejected parent’s mind also, is another key task. The wall is made up of feelings which have been exploited to form a defence mechanism. The wall IS the defence and like all defence mechanisms, it is there to protect the child. It is there in the rejected parent’s mind as a defence too. It is often also in the mind of the parent who has influenced the child to enter into psychological splitting. Therefore, the first set of tasks a practitioner must undertake in assessing a case where a child rejects, is to understand where the walls exist in the minds of the family members. Difficult to do if the people we are working with are not aware that the wall even exists? Not for the alienation aware practitioner, who understands the questions to ask and the signals which are given that show that the wall is in place. The wall is in place in the mind of a child who tells you that one parent is perfect and the other parent is not. The wall is in place in the mind of a parent who tells you that the other parent is wholly and utterly to blame and they are perfect. Breaking through or breaking down the wall demands that practitioners understand the emotional make up of the wall. Shame, guilt, fear, anxiety, blame, worry and false beliefs are the building blocks which put the wall in place. Understanding how each of these emotions are configured in the people around the alienated child is how we begin to break it down. Understanding how the emotions which make up the building blocks of the wall were created in the child in the first place is about being able to understand the Chinese whispers of the family, those things which are passed from parent to child and back again which create a language of alienation which only those who are involved in it can understand. Chinese whispers are the sentences which end with an intimation. They are the silent exchanges between people which are intercepted by the child, they are the stillness of a room into which the child walks, they are the expectations of the parents, they are the unspoken demands which zing back and forth, they are the things not said more than the things said and they are the coalitions of belief which form in the trenches as the tribes go to war. So much to understand and yet so little in the end when you get inside and underneath the wall. Which of the bricks in the wall is loose enough to take down first. Is it guilt, is it shame, is it anxiety, is it blame, which one is it which can be removed first. Because when one brick in the wall is removed, the rest can and often do come tumbling down. Traversing the alienation landscape requires understanding the language as well as knowing the road map. It means understanding the contours and hearing the whispers of the dead that haunt the living. But as more come to do this work (and when I say that I mean do the work, not just talk the language of narcissistic pop psychology which is currently sweeping the UK), the land will be mapped, the walls will be marked and the whispers will be noted and analysed. And as we do this, the work of reunification, which is the next stage on from understanding parental alienation, will become codified and embedded in our international response to the problem. And then the Chinese whispers and walls will be known about as a key risk to children who live in separated family situations. Making prevention of alienation routine and treatment unnecessary. This is just the beginning of the next phase. Taking the walls down together. There is a lot going on in the world to tackle the problem of child abuse known as parental alienation. Here is what the international movement is doing this year. Click on the images to go through to the websites of these four landmark conferences which are all working hand in hand to bring change for alienated children and their families across the globe in 2018. As always, your blog posts make very interesting reading. I think another issue that adds to the Chinese Wall you describe is the upbringing that alienated child has had in terms of modelling social relationships. It is not just the relationship with their other parent that has been affected but their entire ability to deal with socially difficult situations. I have come to this conclusion based on the experiences we have had. My step daughter came to live with us some years ago following a fall out with her mum and was in a terrible state at the time, she now has a strong relationship with her dad, but her metal healing still has a long way to go and this may well be a lifelong project for her. I have noticed over the years that her ability to deal with socially difficult situations both in relation to her family and her peer group is compromised. Not only was her relationship with her dad severed for a while, but also her mother tried to draw her into a state of isolation, where her mother limited her contact with her peer group as well. On top of this, while she grew up there was a strongly defensive response from her mum to any criticism of any member of the family from the outside. As a result, my stepdaughter never learnt to deal with social situation appropriately, whenever a conflict arose with anyone outside of the family my step daughter would always be confirmed in her innocence in what had happened and the evil nature of the one the conflict has arisen with. All in all, she has therefore never had an appropriate model to understand how social relationships works. Fortunately, she is an intelligent young woman now and has learnt to trust her dad and me. Thus, when she ends up in social situations that she cannot make sense of she will come and ask and she is capable of understanding what happened in hindsight with guidance and even to start asking for help when in a situation she cannot handle. She asked me recently after I had talked her through the emotional fabric of a situation that had risen, how I knew so much. I smiled at her and told her that I had quite a few more years’ experience than her. I hope with time she will learn to use her intellect to help her resolve these situations which most of us solve intuitively without the need for conscious thought. Needing to do this consciously rather than intuitively will always make these situations more difficult for her than they could have been, but it is a much better place to be, than trapped in a belief that the world is black and white and full of unseen Chinese Walls. So my question is….how do these children decide to take down the wall? 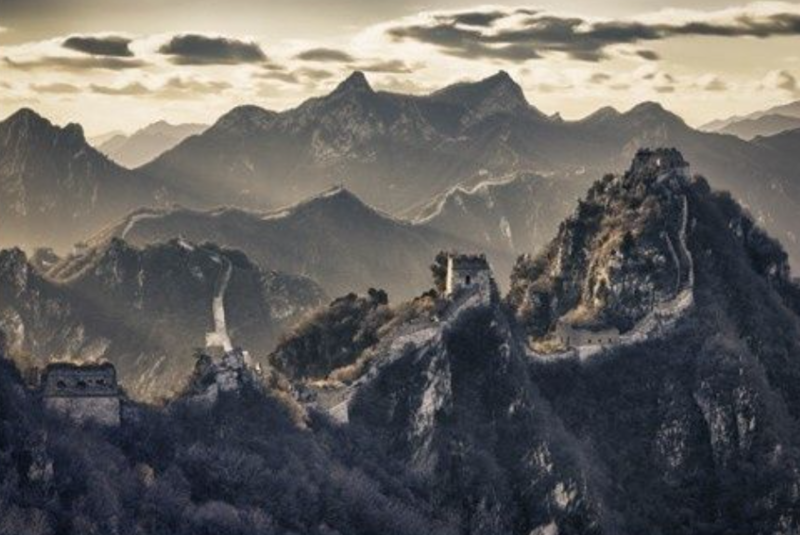 China has had the Great Wall for centuries and has no intention of breaking down the wall. I have no influence over my children, four of them and all in their twenties. I have tried to talk to people that talk to them. I have tried to give some insight into what is going on without turning them against me. Therefore I can not say much but try to make these people think. My children have to come to realizations themselves. How does this happen? I have read that it can take seven to forty seven years for children/adults to see that they have been alienated. Three of my children left ten years ago and one left five years ago. None of them live with their father anymore. He has ruined his career as a teacher due to inappropriate actions with students and I had thought that would have brought them back to me but it did not. What can I hope for that will help my children break through this??? So – what do rejected parents do from a distance to help this wall come down (or at least not keep it going higher), when the alienated young adult is not specifically receiving therapy for it? In our case, my husband is more or less down to Merry Christmas and Happy Birthday emails/texts to his son, with another one or two here or there just saying hello, which go without response entirely. We are not sure if he even sees them. The alienated 18 year old no longer responds with hateful texts, which I think is good, but being ignored completely is worse for my husband, who preferred to at least know his son got his communications even if he had to take a some abuse in the process. Also, in my region, we have now had the second separate case of a young adult and a parent being charged with murdering the other parent, both in the context of custody battles over younger children. I can’t imagine how high the Chinese Wall must be for these alienated children, all of whom on the surface seemed “normal” and high-functioning, and are now likely going to spend their lives in prison. At 18 if the abusive texts have stopped then your husband needs to keep going into the void Cara. He needs to keep sending texts and emails and cards on appropriate days. It requires a sustained period of doing this – years in some cases – because the wall is not known about, it is a defence mechanism. This is why alienation is so abusive and why we must raise the consciousness of mental health about it. In terms of parent and child murdering the other parent, well that is at the extreme end but that is an example of just how delusional and harmful this mental health issue really is. I’ve had a dose of delusional mindsets on here today, the same kind of delusional beliefs that go to make up the group of parents who would influence their children to believe harmful things have happened. Some of these have been threatening me with legal action and exposure, in the light of the death threats I have received these are mild in comparison but these are the mindsets which create scenarios in which people kill, maim, lie, make false allegations, have the other parent arrested at dawn and on bail for months and more. It’s a nasty nasty environment. That the abusive texts have stopped is a very very good sign. Keep going now into the void. Thank you, Karen – I keep telling my husband it’s a good sign that he hasn’t had any abusive texts from him in over a year. In fact, his last communication with his son, last summer, was his son reaching out to ask my H some questions (benign ones, but about an interest they both share). Then nothing more for 7 months, which feels demoralizing to him. Wow. This is spot on. Excellent article. It is exactly what I am dealing with now, and this is so helpful. Thank you. Taking this slightly out of the context you’ve used it Karen can I ask about the situation where ‘ children convince a parent to believe that harmful things have happened to them’? I know you’ve talked elsewhere about the fact that some children do lie about these things…….. discerning what is real and what is not can be a minefield………a case of damned for believing the children but terrified that if you don’t you could be letting the kids down in the worst possible ways. Being seen to believe the kids when the social workers don’t leads to a hellish position and accusations of rigidity of thinking etc. What can a parent do in such a situation? I wonder if the Wall is constructed of bricks made of Anger? Oh, how true this is. I now understand the shame that my daughters’ mother struggled with, I observed generically “the demons” for decades. To see this generationally passed along, gracing (sic) my daughters with a similar/but/different “shame” to bind and isolate them – oh, this has been a fascinating journey. And the anger – the disturbing and obvious sign of disorder – I never understood what it actually masked. The dysphoric nature of it, the imbalance vs what I saw as reality, this baffled me for so long. My eldest daughter celebrates her 22nd birthday tomorrow, the seventh we will be apart. I have already lobbed a love bomb over the wall, unsure if it will clear the top. I pray every day for awareness, for reclaiming her authenticity. I’ll do the same again tonight, and then tomorrow in morning mass. Thinking back to what was the happiest day of my life to that point. Twenty two years ago. It strikes me how many of us are apparently carrying a false belief that the legal age at which society decrees that a child is now an adult somehow brings with it an automatic and equal leap into emotional and psychological maturity…….yet how many of us know from ourselves that such a belief is not borne out in reality? There are an abundance of children in adult bodies. How could there not be? Where do we get to learn about our psychological selves as we grow up? And how? It is not a priority in our education systems. Instead our emotional/psychological maturation is left to chance and circumstances. We remain largely unconscious of ourselves unless we consciously and actively make the effort to learn through looking at ourselves and our pasts. For many alienated children I doubt they even see the need to do this. Why would they? This I fear is the uncomfortable, cold reality for rejected parents…..we want nothing more than our children back but something, somehow, has to trigger that first doubt in the alienated child’s mind which could start them on their journey back. I think Karen this is what you refer to when you talk of “sowing the seeds of doubt”. Without that first nudge to their consciousness I fear they could remain lost forever. Durrrh! Sometimes im a bit slow on the uptake. How much of most of the time is up for debate. Anyway, its just dawned on me that after our little conversation about what you drew, gathering together, i had a reading which related to that….but even more mad, after you shared this blog although im not sure long after, and certainly not with this article in the forefront of my mind, i drew the following….this is all very auspicious. I have a further confession, although i regard Wilhelm as the proverbials, Mr Legge makes a good companion a bit like an accesible thesaurus fully loaded with synonymcanpoops! 43, Breakthrough, with moving line 3…..changing over to oh i forget the number, somrthing to do with Tui over Tui, The Joyous. Im taking from it quite a lot, mirroring what has and is occuring, if i overlay youknowwhoflumpcoughblobfishcough…as the inferior, the line holds true., again time is a component here that can not be forced nor the problem tackled directly head on……..for the situation is still one of considerable peril, at least to the one who draws most of our concern, consideration and care. In a way….trying to conjour my own images, im going to with something like a youngfox is on thin ice with threatening shadows beneath the surface of the ice, and im guessing what appears to be a large bear blocking his only way off the ice onto the shore. ……stuck, frozen….ice-olated…afraid to move, where to go, what to do….. and the bear also appears to have the young foxs mother on a leash. If the young fox thinks im the bear with leashes i’ll show my arse, even if he tells you so…..he doesnt want the ice to break beneath his feet not the bear the leash around his mothers life to get excited. appreciation and makes no mistake, because he remains true to himself. therefore fight without quarter is necessary if the good is to prevail. evil is not possible; evil must under all circumstances be openly discredited. in the end because thus we ourselves get entangled in hatred and passion. energetic progress in the good. certainly experience a collapse. For all gathering is followed by dispersion. This hexagram, like sun, is one of the eight formed by doubling of a trigram. themselves through the medium of gentleness. outwardly as yielding and gentle. based on steadfastness if it is not to degenerate into uncontrolled mirth. will not shun death itself, so great is the power of joy over men. sided about the learning of the self-taught.